This garage is one of the cleanest and with the most beautiful cars - and they are beeing used thru the summer, all five. The owner of the 5 outstanding cars is a man of details and eye for HIGH finish. 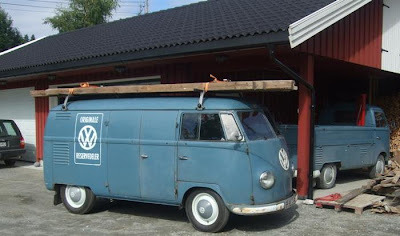 Many thank`s to T2man for his hospitality last nigt for the Nordic VW classic meeting (with SCC). You can see that Sechs volt is present in the garage!